For many years I have thought about writing this book. Now here I am on the twelfth of December 1995 and I am about to make a start. I cannot type as yet, only with two fingers, so I guess this is going to take some considerable time. The book will be about the first seventeen and a half years of my life, the good times, the bad times, the people that I knew, my brothers and sisters, my uncles and aunts and of course my loving parents. During the journey many different characters will come to light, not forgetting the many animals, some of them very faithful ones, who have journeyed along the same sometimes bumpy road as I did. All of these memories God has privileged me to retain over the past sixty-six years, some of them as if they only occurred yesterday. The very first thing that I can recall was being pushed along by my mother in a wicker pushchair. This was probably in Ballymagovern Co. Cavan as I was told many years later that my parents lived in a little house near the bridge on the Blackwater River. Shortly after this time my father got a job on an estate in Bawnboy, the owner was a Mr. Bertie Johnstone who lived in the big house along with a Mr. Richards and a housekeeper. 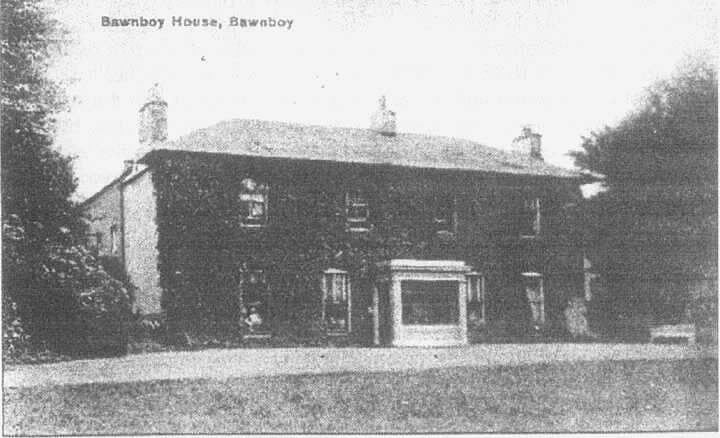 My mother, father and myself all moved down to Bawnboy and we were given a small house in a wooded area overlooking Bawnboy, which was about one mile away. The house had just two bedrooms and a kitchen with an open fire on the hearth. There was a small porch which had two half doors and this led to the only door into or out of the house. There was no gas, electric or water in the building, the water had to be fetched from a well about a quarter of a mile from across the fields. The lane which led up to our house had a big iron gate across its path at the entrance to the main buildings on the estate, the other end of the lane led up to some paddocks and eventually to a big wooded area. The lane in front of our house went up to a boundary fence and if you climbed up on top as I used to do you could see across to Coffey's farm, our nearest neighbour, who lived about a mile away. It was a very peaceful place to live, there were no bikes, cars, planes or buses, the only sounds I used to hear were animals in the adjacent fields, the birds and at night the foxes of which there were very many. In the early summer we always heard the Corncrake, there were many nights when I went to sleep listening to them. We did not have any animals of our own except for some hens and chickens. The fox took his toll of the hens at nightime and the sparrow hawk did the same to the little chickens during the daytime. It seemed to be a constant battle against these two foes. My father kept a gun and sometimes he would take me with him up to the woods to look for the foxes but they were far too clever for us and we never saw any of them when there was a gun around. Once a day my mother and I made our trip across the fields to collect water. I had a little cane I used to take this with me just in case the foxes came after us. We had to walk along a little stream under some bushes until we came to a shallow well. It was during one of these trips when I lost my cane, my Mother said that the fairies must have taken it and it was a long time after that I found it hanging on the branch of a tree.